Russ Chaplin's Driving Instructor Blog: Will We Ever Really Have Driverless Cars? Will We Ever Really Have Driverless Cars? I've been reading up on driverless cars and I must say I'm a bit skeptical. Maybe it's because I rely on teaching people to drive for my living. Maybe it's because I think that the skills used in good driving cannot be replicated by a computer. There's a lot more to it than number crunching as you well know. There's a big trial starting next year which checks out two different types of vehicle. 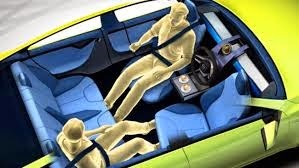 Completely driverless cars and cars where the human driver can take over at any time. According to the Transport Minister they can improve safety, reduce congestion and be better for the environment. There's no explanation of how but it must be true. Two thirds of British motorists are against the trials taking place on British roads and nine out of ten drivers saying a front mounted incident camera should be mounted so liability can be established in the event of an accident. If it's the car's fault then who is to blame in an accident? This shows a skeptical attitude towards the new technology and I must say I share this view. After all a computer can't think. There is so much more to safe driving than not hitting whatever object is in front of you. How will the cars communicate with each other? Drivers use a wide range of signals and gestures to communicate with each other when a situation arises that is not clear cut. A great deal of co-operation is required to get through those tight meeting situations where priorities aren't clear. How can a computer anticipate what will happen next? Forward planning is essential to a good driving. I suppose that there is software that takes care of it for us. Talking about software, there are people working behind the scenes to make sure the robocar will have all the latest map info so it knows where it is in the world. What about roadworks and temporary diversions? That's a lot of info. As the car can't think it can't figure it's way around something that's not already programmed in to it's brain. Whoever is doing the roadworks would have to upload the data on where and when the roads will be blocked and the information would have to be accurate. Sounds like a lot of work to me. I can't see this driverless car thing happening any time soon. I like it when people learn new skills and take some responsibility for themselves and others. It's all part of life and growing up I suppose. Constantly handing over our life choices to new technology is a disturbing trend. Or maybe I'm just old fashioned.